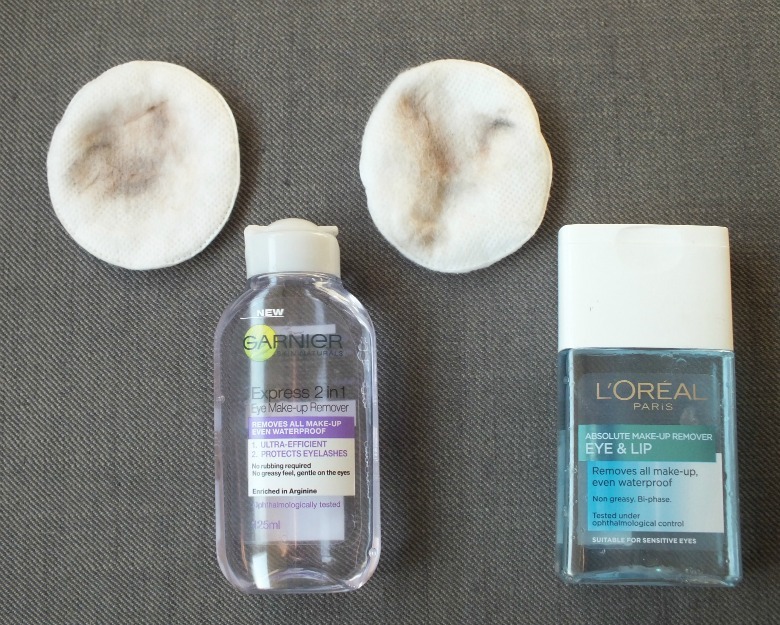 I've already pitched L'Oreals eye make up remover against Clarins in this post and now it's time to battle it against it's drugstore counterpart although I'll start now by saying it's fairly safe and equal fight. Both products offer 125ml of bi-phase eye make up remover although the price differs at £3.50 for Garnier Express and £4.99 and to be frank that's where, aside from packaging the differences lie. I popped some of each product onto a cotton pad to remove my eye make up and the results as you will see in the photo were matched equally. If I were being picky I'd say there looks slightly less on the L'Oreal pad but the other side reveals them equal in what has be removed from the eyes with little else being removed. Garnier say theirs is 'enriched with Arginine' which will help care for your lashes whilst L'Oreal say that their non-greasy formula is suitable for sensitive eyes and contact lens wearers. My eyes lean towards sensitive and I am a contact lens wearer but neither product leaves me with the greasy film you can sometimes find with this type of product. If I wasn't already satisfied with choosing the 'cheaper' Garnier option for my winner then the bottles would definitely decide it for me. It's well known that the L'Oreal bottle leads to product spilling everywhere which is avoid with the more traditional Garnier one and it's a nice petite size that stores well. Yes, I can see that the L'Oreal bottle shape would present problems. I agree, L'Oreal have such badly designed bottles, not only do you pay more for their products, but you end up losing more through waste and spillage. Exactly, if it was cheaper I wouldn't mind so much!